Take a step back in time at Fort Christmas. Situated just a few miles north of the main highway (Highway 50) separating Central Florida's Orlando and Titusville on Florida's Space Coast is the Fort Christmas Historical Park. Located at 1300 Fort Christmas Road in Christmas, Florida. A replica for the original fort, built in 1837 during the Seminole Indian War, anchors the 25-acre park that also features a traditional Florida "Cracker" house, a school house and lunchroom, seven pioneer homes, a sugar cane mill, and historical farming equipment. The historical park also includes several picnic pavilions (including a large one that is covered and screened), restroom facilities, a unique themed children's playground, a baseball diamond, tennis, volleyball and basketball courts. The facilities are perfect for family gatherings, especially children's birthday parties. Fort Christmas Historical Park is open Tuesday through Sunday 8:00 a.m. to 8:00 p.m. during the summer and 8:00 a.m. to 6:00 p.m. during the winter. Access to the fort museum is 9:00 a.m. to 4:00 p.m. The park is closed Mondays and holidays. Admission is free to the public. The first weekend in December each year, Fort Christmas holds Cracker Christmas that features pioneer demonstrations, craft vendors, BBQ and more. 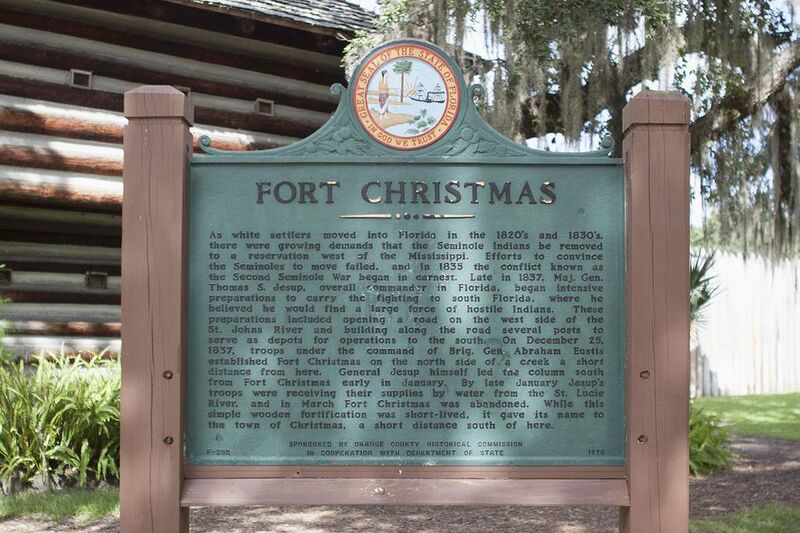 Fort Christmas is located two miles north of East State Road 50 on County Highway 420. Stop by the Visitor Center to uncover a wealth of historical information and browse through the gift shop. The Visitor Center is a replica of a Florida Cracker house, the popular architectural style of Florida house built in the 19th century. Although, the one at Fort Christmas Historical Park is constructed out of modern materials. Two display cases on the porch of the Visitor Center offer a unique overview of Fort Christmas' history and is just a glimpse of what you'll see inside. The museum at Fort Christmas also features artifacts from the pioneers and Seminole Indians who lived in the area. Fort Christmas Historical Park features a replica of the 1837 fort that was built during the Seminole Indian War. The original fort was built as a supply depot for American soldiers looking for Seminole Indians during the war, but March of 1838, the fort was abandoned after it was discovered that many of the Seminole tribes had left the area. The bent limb of an old oak tree forms an archway to welcome visitors to the entrance of the replica of Fort Christmas. This picture was taken the through the slats of Fort Christmas, from the outside looking in. Arrive during operational hours — 9:00 a.m. until 4:00 p.m. — and you'll get more than a peek into the historical significance of Fort Christmas and the Seminole Indian War. A Cracker house is a wooden shelter built by the early Florida and Georgia settlers that were lured to Florida by cheap and plentiful land. Because these pioneers arrived with few provisions, they needed to erect shelter as quickly and cheaply as possible. The land provided abundant supplies of cedar and cypress. Often rocks or bricks made of oyster shell and lime served as pilings to keep the shelters off the ground. The valued wide porch of today was a necessity then. In the days long before air conditioning, it provided relief from the relentless Florida sun. Interestingly, many historians will tell you that "cracker" originally meant "a braggart." Some use the term today to describe country folk or someone who was born in Florida. One story though goes back to Florida's early cowboy days. Back then, cowboys used a long (10- to 12-foot) whip made of braided leather. When a cowboy would snap his whip in the air, it made a loud "crack." The sound alone would bring stray cattle back in line quickly and earned the cowboys the nickname of "crackers." Yes Virginia, there really is a Christmas... Christmas, Florida!